Our white face cattle watching dad scythe some clover for a late summer feeding. Our herd consists of Hereford cross animals. There is a bit of the following breeds in the herd over the last several decades: Hereford, Simmental, Shorthorn, Red poll, and Ayrshire. The breeds brought different characteristics to the Herd such as improved milk production for calves, easier calving, and bigger dressed weights at processing. Today, our cattle are mostly white-faced with different reddish hides. They are very docile and friendly animals to whom we are indebted. Due to the climate and farm infrastructure, at present, our cow-calf operation is operated on pasture from May to December. Once the pasture is low we bring trailer loads of fresh cut grass in several times daily to keep them on their grass diet, which is composed of several native grass perennials, clovers, timothy, etc. We are not completely 100% grass fed as we do feed some local grain to our animals during the winter months while they are stanchioned in the barn. Our yearling heifers and bulls, as well as our calves, are kept in free movement pens until processing. A yearling bull in a free movement pen having his fill of hay. Our animals do not receive hormones, antibiotics, or drugs. Our goal in the near future is to become 100% grass fed once we have a free movement barn setup that would allow our cattle to come and go from the barn as they please. 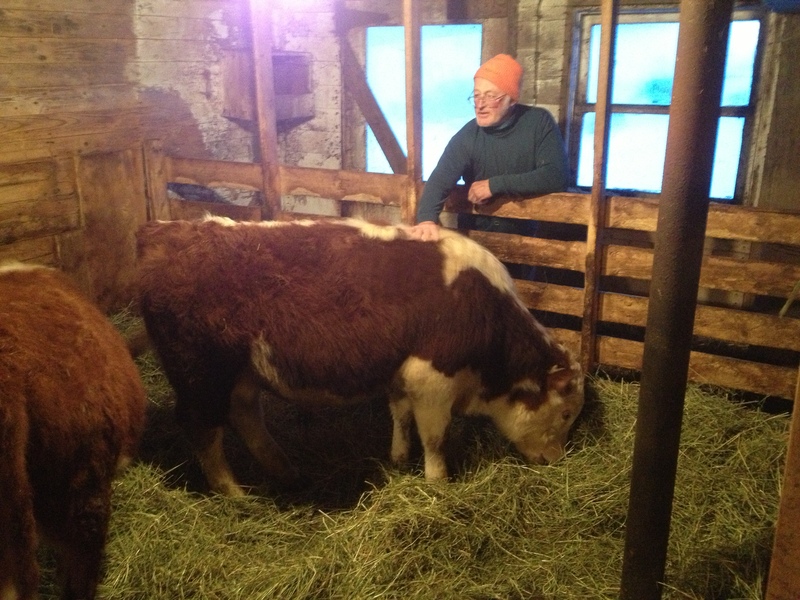 In other words, the barn would act as a sheltered feeding area and allow cattle to better explore their cow-ness. It is important to mention that beef that is completely or mostly grass fed is much higher in CLA (conjugated linoleic acid), omega-3 fatty acids, vitamin E, and beta carotene. Not to mention the steak is much leaner and decently marbled compared to conventionally grain fed beef that you would find in stockyards. The research points to a much healthier meat product that refutes claims that red meat is bad for you. Our cow-calf operation is hard work, especially during calving season, but it is rewarding to no end knowing that we are doing our best to provide local beef products to those who care to be informed concerning where their beef is coming from and how the animals are handled. 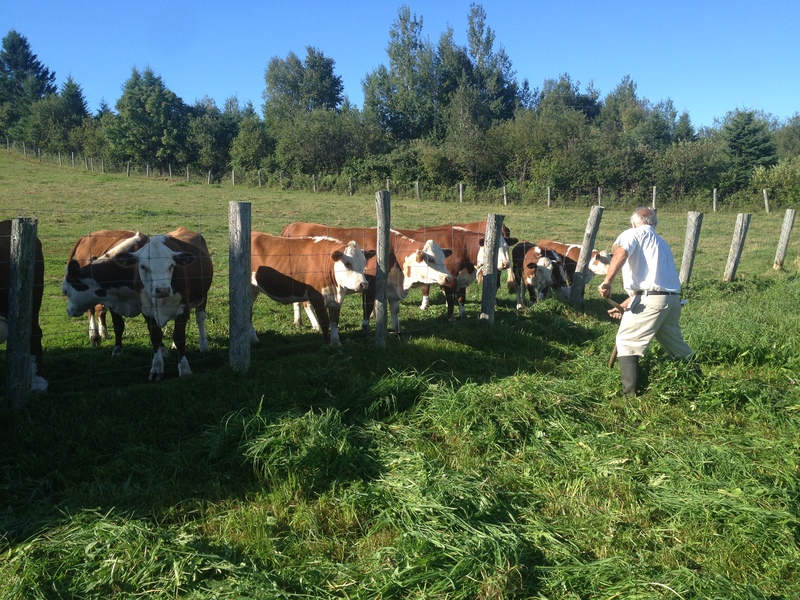 Our views on animal husbandry are reflected in our treatment of our animals: we kiss, hug, and love our cattle while they are with us and treat them with the highest ethic of care knowing that they give their lives to provide sustenance for us and other families in Restigouche County. If you have any questions, drop us a line. We pride ourselves on transparency. Kelsey, we care very deeply about our animals however, the beef industry has a long way to come with the treatment of animals before they go to table. For example, the use of electric prods is still used unreasonably in the transportation of livestock. If you are interested in good reading, you can research Temple Grandin and the changes she brought about in the USA with the movement and treatment of animals. I’m very glad to have found your blog. In the last few years I’ve been watching all of Polyface farm’s videos on youtube wondering if this exists in the area. I’m looking to get a few laying hens this spring and was wondering if we can get them from your farm? Also, do you sell meat in the winter? Just came across your reply now Joanne. I had spoken to you on the phone but wanted to let you know that we will have freshly processed beef the second week of February. I will also be hatching chicks early this spring should you be interested in raising your own laying hens from day olds. Thanks for your reply! I still want to go get some of your beef but I’ve been having a hard time finding the time. (Always harder in the winter…) Now that I know you will have some fresh, I will certainly make it a priority to go.